If you already have a desk that you love but you’d really like to get into standing while you work, we have a great solution for you. Turn that beloved desk of yours into a DIY hand crank desk! Yes, there is a fairly simple way to convert your existing desk into an adjustable height standing desk. All you need is a little elbow grease – and the ModTable Adjustable Height Standing Desk Manual Base, by MultiTable. This product, which costs $479.00 (with free shipping) on Amazon right now, is only the base for a standing desk, not the desktop itself, and it can be raised or lowered by turning a removable hand crank. In order to build your own hand crank desk, simply detach the legs from your original desktop and then attach the ModTable base in their place. Your good old desk can now be raised or lowered whenever you wish. 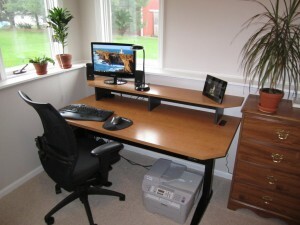 Don’t Want to Part with Your Existing Desk? Chad Warner, of OptimWise, was unwilling to part with his existing desk, one that he purchased at a garage sale. It was sturdily constructed and, as you can see from the above photo, featured both a large work surface and a smaller riser or raised shelf at the back. Chad positioned his keyboard and mouse pad on the lower surface and his monitor on the raised one and he didn’t want to give up the ergonomic comfort this provided him. So he located a hand crank adjustable height desk base on Craigslist for a great price and put it together with the top of his original desk. While Chad isn’t sure who manufactured his base and hasn’t been able to locate any more of them, the ModTable base would work perfectly in a case like this. 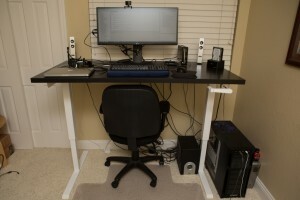 Want An Adjustable Height Desk at the Lowest Price Point? And while Roy Park didn’t have a desk he was particularly wedded to when he decided to start using an adjustable height desk, he didn’t want to fork over more money than he absolutely had to. At first he considered two higher end, ready-made options, but in the end he settled on the ModTable base. MultiTable does sell the base in combination with your choice of a laminate top in white, black or espresso, but that desk top will cost you an extra $120.00 plus $62.48 for shipping. Park thought that seemed unreasonably steep for a laminate surface, so he ordered just the base and located a cheaper laminate work surface, at Ikea. It set him back only $30.00. Of course, you could also use a real wood surface instead of a laminate one, and still save money. At first glance you may feel that, at $479.00, this DIY hand crank desk base isn’t an inexpensive option, but trust us. Once you start investigating the prices of ready-made height adjustable standing desks, which tend to start at over $600 for low end versions, you’ll want to give this DIY version a try. If you do, please send us a photo! We’d love to see what you come up with. Thanks for including my adjustable-height standing desk! I’ve gotten so used to it that now I get uncomfortable when I need to use a sitting desk for more than a couple hours. I highly recommend switching to a standing desk.